Brisbane Food Trucks allows you to quickly and easily locate your nearest food truck, find out what it's serving and when and even how to get there. You can also search for your favourite truck by cuisine and find out about upcoming food truck events. From buffalo wings to tacos, wood-fired pizza to gourmet sliders, bnefoodtrucks is your number one guide to food trucks in Brisbane. The application process has two stages. The Gourmet Food Truck Approval Roadmap shows the steps required in each stage. Stage 2 is a self-assessable permit. Applications can be made online through Council’s website. Before submitting an application, please read the Gourmet Food Truck Information Kit. Want to hire a food truck? Contact a food truck directly to make your booking. Go to the 'Food Trucks' tab to see food truck profiles and contact information. 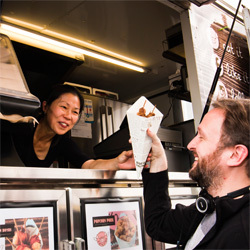 Email Council’s Business Hotline at bnefoodtrucks@brisbane.qld.gov.au or call 133BNE (133 263).